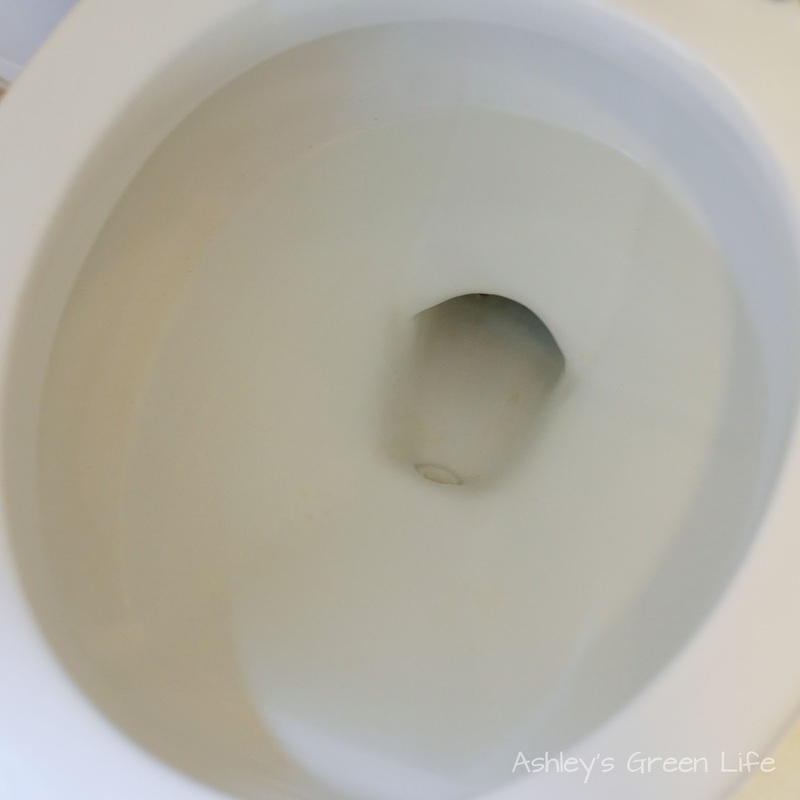 Ashley's Green Life: Clean Toilet Bowl Stains...Without Chemicals! Clean Toilet Bowl Stains...Without Chemicals! I've been known to get a little excited about certain things that most people wouldn't consider exciting...such as a recipe for gluten-free vegan pancakes that actually tastes good, a sale on quinoa, and this time a new way to clean stubborn toilet bowl stains without chemicals. 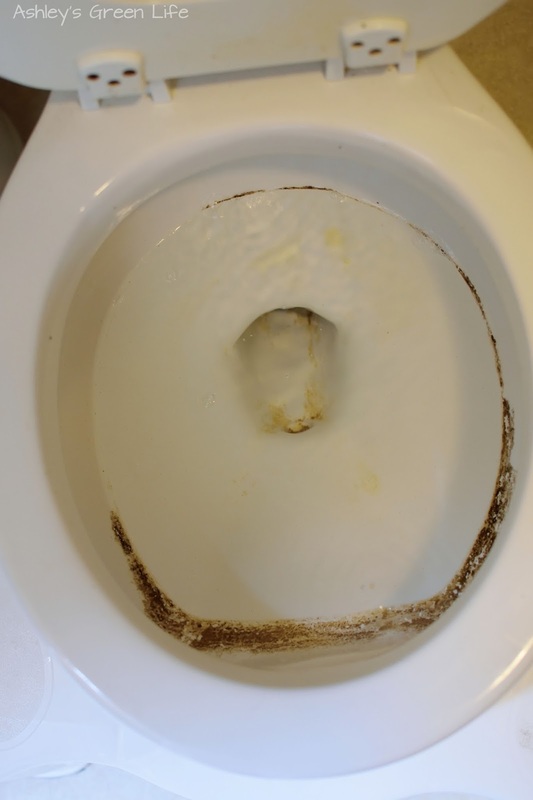 See I've had this toilet that was stained the day we moved into our house and that has stayed stained for the past 6 years because I can't get the stains to budge, despite green cleaners and even chemical cleaners. 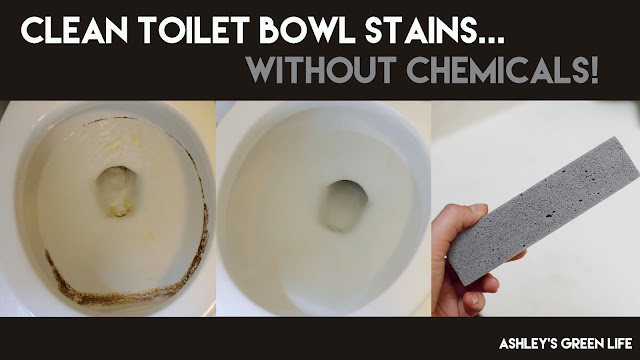 But when I heard the idea to use a pumice stone to scrub hard water stains off toilet bowls, I thought, why not? I've got nothing to lose but a few bucks and I've already tried everything else. But as luck would have it, it did work! 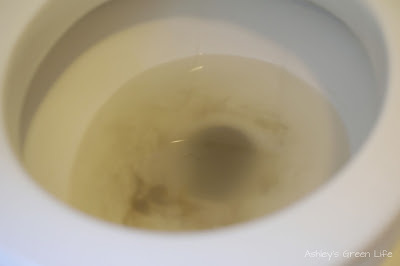 It worked so well that I ran around my house doing the "happy dance" as I scrubbed away at all the annoying stains that I had just learned to live with on the other toilets in my home. 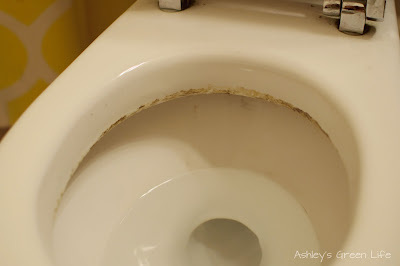 So there you have it, the magic trick: using a pumice stone to remove stubborn toilet bowl stains! In case you're wondering where to find one of these things, I picked mine up on Amazon and it's a brand called, Pumie "Scouring Stick". I got a pack of two for around $5. There are a variety of brands and different features (some have a stick attached for easier toilet bowl cleaning) so find the one that works best for you. You can find them at hardware stores too. 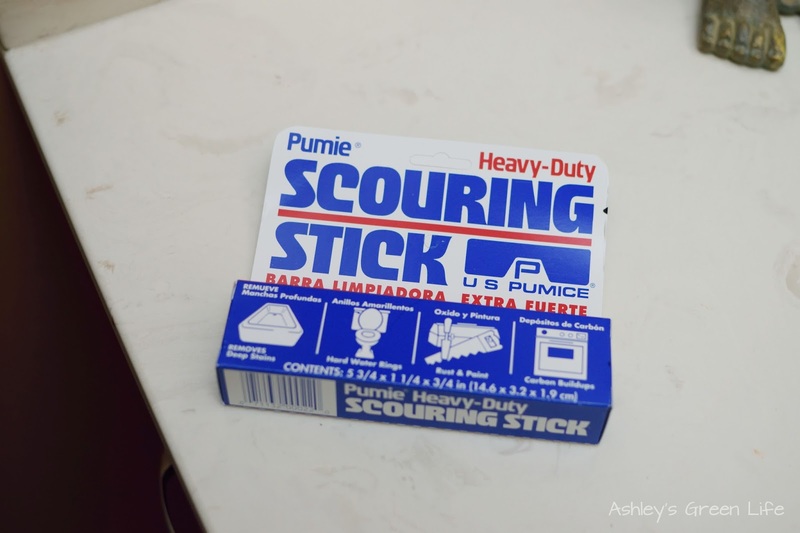 Now these pumice stones aren't just for cleaning toilets, as you can see by the package, they are also good for cleaning tools, ovens, grills, pools, and bathtubs among other things. 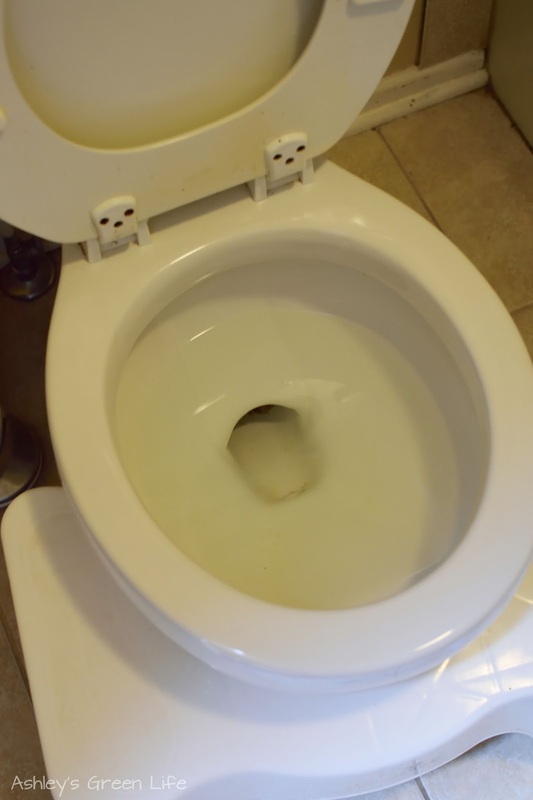 If you're like me, you might be a little worried about the stone scratching your toilet bowl, but it does not. If there is an item you are worried about getting scratched, you can try a "test" spot just to see before you go all in and try it. One tip with the pumice stone is that you MUST use it with water. Since I was cleaning toilets, I had water right there (and while gross, it served it's purpose) of re-wetting the pumice stone. According to the package the water mixes with the pumice to create an abrasive solution that gets rid of those tough, built up stains. 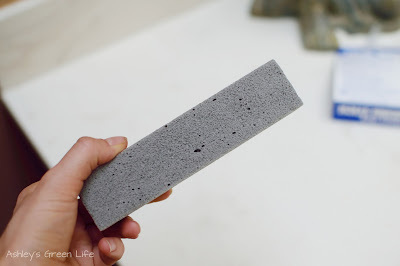 So if you are cleaning an item that does not have water in it already, be sure to keep getting your pumice stone wet so it will work most effectively. multiple products, would get clean! scrub it. See a mark, scrub it. If it's still there, keep scrubbing until it's gone! can see what's left to clean. before, but now I'm happy too. and build up of it's own. And here's the after, looking much better! 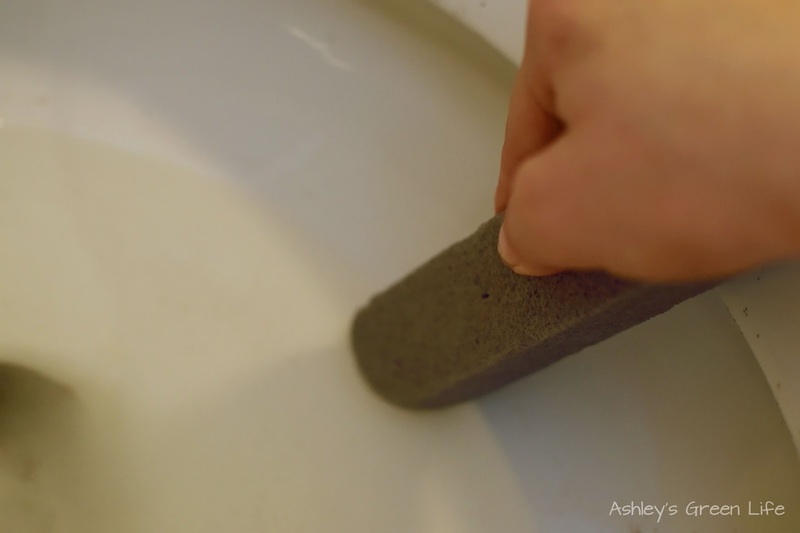 So there you have it, that's how I use a pumice stone to clean those stubborn toilet stains...without chemicals. Have you ever tried a pumice stone? Do you have toilets in need of some help? Let me know if you give it a try! Still on the fence? Check out the reviews for this pumice stone on Amazon, it was enough to sell me on the product by just looking at everyone else's before and after pictures, hope it can help you too!